Publishing on a 2-month lag, the Federal Home Finance Agency said home prices fell by 1.6 percent nationally in December. And that’s an average, of course. Some regions performed well in December as compared to November, others didn’t. These aren’t just footnotes. They’re an important piece toward understanding what national real estate statistics really mean. In short, “national statistics” are just a compilation of a bunch of local statistics. For example, if we dig deeper into the FHFA Home Price Index 70-page report, we find that cities like Terre Haute, IN, Buffalo, NY, and Amarillo, TX posted year-over-year home price gains. You won’t see that in a “national” report. Furthermore, it’s a sure bet that those same cities, you could find neighborhoods that are thriving, and others that are not. Just because the city shows higher home values overall, it won’t necessarily be the case for every home in the city. Every street in every neighborhood of every town in America has its own “local real estate market” and, in the end, that’s what should be most important to today’s buyers and sellers. National data helps identify trends and shape government policy but, to the layperson, it’s somewhat irrelevant. 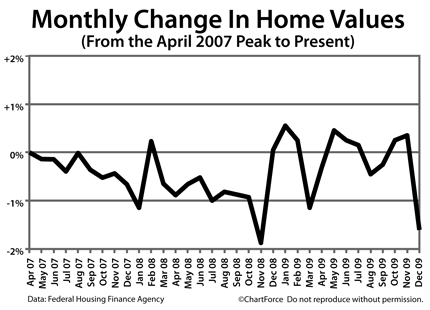 So, when you need to know whether your home is gaining or losing value, you can’t look at the national data. You have to look at your block — what’s selling and not selling — and start your valuations from there. The housing recovery showed particular weakness in the New Homes Sales category last month — good news for homebuyers around the country. New Home Sales fell 11 percent from the month prior and posted the fewest units sold in a month since 1963 — the year the government first started tracking New Home Sales data. Right now, there are roughly 234,000 new homes for sale nationwide and, at the current sales pace, it would take 9.1 months to sell them all. This is nearly 2 months longer than at October 2009’s pace. Now, these might be less-than-optimal developments for the economy as a whole, but for buyers of new homes, it’s a welcome turn of events. Home prices are based on supply and demand, after all. As a result, this season’s home buyers may be treated to “free” upgrades from home builders, plus seller concessions and lower sales prices overall. It’s all a matter of timing, of course. New Home Sales reports on a 1-month lag so it’s not necessarily reflective of the current, post-Super Bowl home buying season. 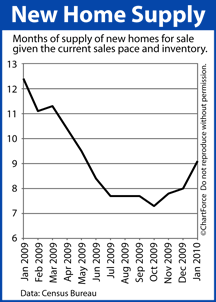 And from market to market, sales activity varies. That said, mortgage rates remain low, home prices are steady, and the federal tax credit gives two more months to go under contract. It’s a favorable time to buy a new home. Friday morning, headlines in Utah and around the country read that mortgage rates were down 0.04 percent, on average, since the week prior. The story behind the headline was sourced from the Freddie Mac Primary Mortgage Market Survey, am industry-wide mortgage rate poll of more than 100 lenders. The PMMS has reported mortgage rate data to markets since 1971 and is the largest of its kind. See, unlike governments and private-sector firms, when consumers are in need mortgage rate information, they need the information delivered in real-time; for making decisions on-the-spot. Consumers need to know what rates are doing right now. According to Freddie Mac, the survey’s methodology is to collect mortgage rates from lenders between Monday and Wednesday and to publish that data Thursday morning. The survey results are an average of all reported mortgage rates. The problem is that mortgage rates change all day, every day. The PMMS results are skewed, therefore, by methodology. And, meanwhile, the issue was compounded last week because mortgage rates shot higher Wednesday afternoon — after the survey had “closed”. The market deterioration ran into Thursday, too — again, unable to be captured by Freddie Mac’s PMMS. 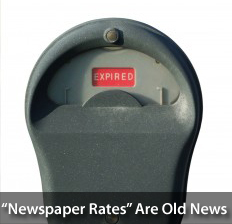 Although the newspapers reported mortgage rates down last week, they weren’t. Conforming mortgage rates were higher by at least 1/8 percent, or roughly $11 per $100,000 borrowed per month. In some cases, rates were up by even more. Newspapers and websites can give a lot of good information, but pricing is far too fluid to rely on a reporter. When you need to know what mortgage rates are doing in real-time, make sure you’re talking to a loan officer. Otherwise, you may just be getting yesterday’s news. Mortgage markets had a terrible, holiday-shortened week last week as Wall Street responded to worse-than-expected inflation data and action from the Federal Reserve. Mortgage bonds sold off with force, causing mortgage rates to rise for the second week in a row. The two biggest stories from last week both came from the Federal Reserve. The first was the release of the FOMC January meeting minutes which showed more confidence in the U.S. economy than Wall Street expected, and the second was the Fed’s surprise announcement to raise the nation’s Discount Rate to 0.75%. Both sparked risk-taking on Wall Street and bonds sold-off as a result. Now, the Fed Funds Rate won’t climb anytime soon and neither will Prime Rate, but the Fed has sent a clear message to the markets — The Era of Loose Monetary Policy is over. After last week’s performance, conforming mortgage rates for residents of Utah have now unwound most their January gains. If you’re waiting for the right time to lock, it may have been 2 weeks ago. Consider locking in this week to protect against any further deterioration in price. Sometimes, headlines for housing can be misleading and this week gave us a terrific example. 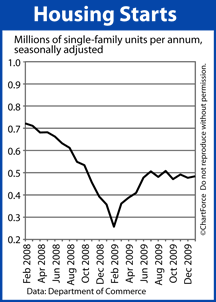 On Wednesday, the Commerce Department released its Housing Starts data for January 2010. The data showed starts at a 6-month high. A “Housing Start” is a privately-owned home on which construction has started. Based to the headlines, the housing market looks poised for rapid growth through the Spring Market. The real story, though, is that although Housing Starts increased by close to 3 percent last month, the growth is mostly attributed to buildings with 5 or more units. This includes apartments and condominiums — a sector of the housing market that’s notoriously volatile. If we isolate Housing Starts for single-family homes only, we see that starts grew by just 7,000 units last month and have failed to break a range since June 2009. January’s tally is slightly below the 8-month average. Perhaps more interesting than the Housing Starts, though, is the Commerce Department’s accompanying data for Housing Permits. After a 5-month plateau that ended in November, Housing Permits posted multi-year highs for the second straight month. 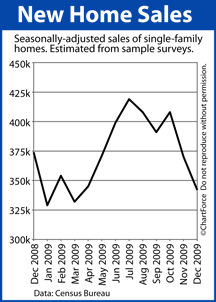 According to the Census Bureau, 82% of homes start construction within 60 days of permit-issuance. One reason permits are up is that home builders want to capitalize on the federal homebuyer tax credit’s dwindling time frame. Sales are expected to spike in March and April and more homes will come online to deal with that demand. Home buyers should shop carefully, but with an eye on the clock. As the tax credit’s April 30, 2010 deadline approaches, competition for homes may be fierce. Mortgage markets reeled Wednesday after the Federal Reserve released the minutes from its January 26-27, 2010 meeting. Mortgage rates in Utah are now at their highest levels since the start of the year. 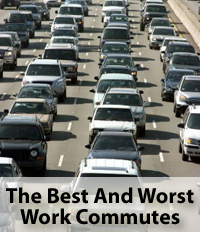 According to the Census Bureau, 2.8 million people commute to work 90 minutes or more each day, in each direction. Now, your daily commute may not be as long, but time spent in cars, trains and buses is time away from work and from family. Drive-time can affect a person’s Quality of Life and it’s one reason why Forbes Magazine’s Best and Worst Commutes is worth reviewing. Measuring travel time, road congestion and travel delays in the 60 largest metropolitan areas, Forbes ranks city commutes from best-to-worst with Salt Lake City topping the list and Tampa-St. Petersburg finishing it. The bottom 5 are Tampa-St. Petersburg, Detroit, Atlanta, Orlando, and Dallas-Forth Worth. Long commutes shouldn’t deter you from moving to a particular city, but the potential commute should be consideration. Before making an offer on your next home, make a rush-hour commute to work from your potential new neighborhood. Then imagine doing it every day. You can read the complete Forbes list of Best and Worst Cities for Commuters on its website. Mortgage markets worsened last week on general profit-taking in the U.S. bond market, combined with talk of a coordinated rescue effort for Greece and its debt burden. Mortgage-backed bonds sold off, causing conventional and FHA mortgage rates to rise. There wasn’t much hard data on which to trade last week, either, so momentum took markets farther than they otherwise might have moved on their own. It marked the first time in 5 weeks that rates rose for Utah rate shoppers. This week, data returns. Expect mortgage market movement. Inclement weather may have impacted last month’s Housing Starts reading so pay closer attention to Building Permits. 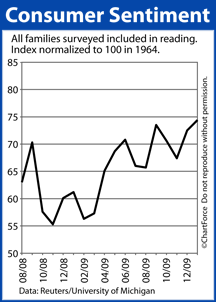 Permits precede actual construction and can be more indicative of economic optimism. If permit readings are strong, it should be a negative for mortgage rates. The same is true for the FOMC Minutes. Last month’s FOMC post-meeting press-release was decidedly middle-of-the-road, but the statement is just a summary of the Fed’s 2-day meeting, boiled down to a few paragraphs. 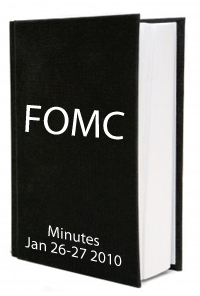 Wednesday’s release of the FOMC Minutes will reveal the deeper discussions among members of the Fed. Wall Street will mine it for clues about the future of the economy. If Wall Street senses optimism coming from the Fed — again — mortgage rates should rise. And, lastly, keep an eye on Thursday and Friday’s inflation data. Inflation is bad for mortgage rates so a higher-than-expected reading should spark a bond market sell-off. Since mid-December, mortgage rates have moved within a tight range and there’s little reason for rates will break this range this week. However, we are near the top of the channel. If you know you’re going to need a rate locked soon, it’s probably best to do early in the week. Consumer Sentiment has been on the rise since last February and it’s something to which home buyers should pay attention. The affordability of your next home may hinge on consumer confidence. As the economy recovers from a near-the-brink recession, many of the elements of a full recovery are in place. Business investment is returning, household spending is expanding, and financial systems are gaining strength. Consumer confidence is at a 2-year high. What’s missing from the recovery, though, is jobs growth. Another net 20,000 jobs were lost in January. Data like that hinders economic growth. That said, twenty-thousand jobs lost is a much better figure than the several hundred thousand that were shed per month throughout early-2009, but it’s still a net negative number. Not only does household income drop when Americans lose jobs but so does the average American’s confidence in his or her own economic future. This is one reason why jobs growth is so closely watched by Wall Street — jobs are linked to higher confidence levels which, in turn, is believed to spur consumer spending. Consumer spending represents 70% of the U.S. economy. As confidence rises, it could be good news for the economy, but bad news for home buyers. More spending expands the economy and, all things equal, that leads mortgage rates higher. Same for home prices. More confidence means more buyers which, in turn, squeezes the supply-and-demand curve in favor of sellers. Later this morning, the University of Michigan will release its February Consumer Sentiment survey. If the reading is higher-than-expected, prepare for mortgage rates to rise and home affordability to worsen. 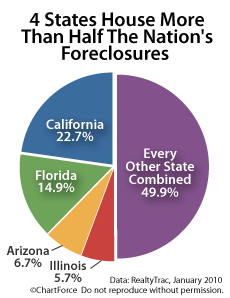 Foreclosures stories dominate the national housing news. It seems at least one foreclosure-related story makes its way to the front page or the nightly news every week. But for as much as the foreclosure filing statistics can be astounding — over 300,000 homes were served last month alone — the prevalence of foreclosures depends on where you live. As reported by RealtyTrac, just 4 states accounted for more than half of the country’s foreclosure-related activity last month. The other 46 states (and Washington D.C.) claimed the remaining 49.9%. However, just because foreclosures are concentrated geographically, that doesn’t make them less important to homebuyers around the country. There’s been more than 1.4 million foreclosure filings in the last 12 months and that’s a figure that can’t be ignored. Distressed properties now play a role in one-third of all home resales. Therefore, if you’re in the market for a foreclosed home, here’s a few things to keep in mind. Properties are usually sold “as-is” and may not be up to living standards. Be sure to physically inspect the home before buying it. Foreclosures aren’t always listed for sale publicly. Ask your real estate agent how to access the complete foreclosure inventory. In order to use the federal homebuyer tax credit, you must be under contract for a home by April 30, 2010 and closed by June 30, 2010. That doesn’t leave much time to find a bank-owned home and make it to closing. If you’re serious about buying foreclosures, it’s probably best to start your search soon. You are currently browsing the KeithSargent's Blog blog archives for February, 2010.